Hanover Homes developed a full range of single family homes within Lake Charles at Saint Lucie West offering a wide variety of floor plans to fit every lifestyle. Spacious designs include many subtle touches that enhance the beauty of these Florida style homes. Copper plumbing, custom kitchen under-the-counter lighting, brick paver driveways, sidewalks and tile roof and a full landscaped package are just some of the added features you’ll find in these unique homes. 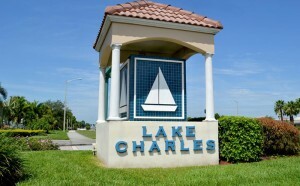 Just moments from home, Lake Charles residents have access to all the convenience of day-to-day life a short drive away. Shopping, restaurants, medical services, schools, churches and more are all within minutes of Lake Charles. With a warm, neighborhood atmosphere, spacious home designs and all the beauty of nature at your back door, Lake Charles offers all the best in Florida living at a price you’ll find surprisingly affordable. Lake Charles Electrician – Goodiel Electric. Looking for a Lake Charles electrician?